A few months ago I searched high and low for a do-it-yourself version of a zebra hide rug and ended up making my own with some spare vinyl and a Sharpie. Although I can't beat my project for price, I can say that vinyl does feel a little weird on the feet. So I was happy to come across a felt version of the same thing via the etsy blog. This project is taken from the book Dorm Decor and is terrific Jonathan Adler-esque take on zebra hide. I would not let my friends eat popcorn on it. 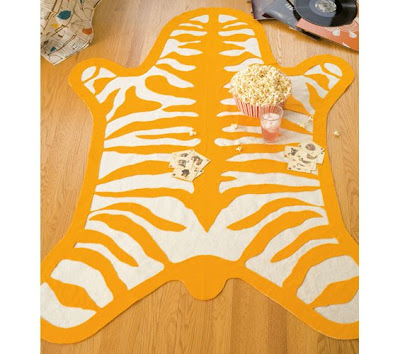 for some insane reason this rug reminds me of a le tigre polo logo. very cute.